Stun Guns Are The New Pepper Spray Youth Radio commentator Jordan Monroe says instead of carrying drab, boring pepper spray, people are picking up stun guns in animal prints and neon colors. Pepper Spray was once just a tool for police and law enforcement officers. Eventually, it became standard equipment for average consumers. 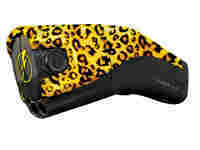 Now some stun gun companies are hoping that consumers will similary swap their cans of pepper spray for something a bit more shocking: like an animal print stun gun. Youth Radio commentator Jordan Monroe reflects on weapons as fashion.